Does your project need a little more umph than our wall wart adapters can supply? Why not give this a shot? 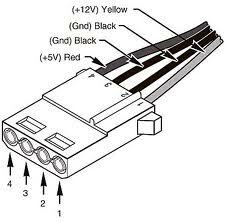 This 2A “laptop brick” supply outputs both 5V and 12VDC and is terminated with a 4-pin Molex connector. The Molex connector is a standard 8981 Series Power Connector, like the disk drive connectors in your PC. Adapters and Cable assemblies are easy to come by at computer supply stores (also, check our related items) so you shouldn’t have any trouble getting your project powered up. To plug the brick into the wall you’ll need an IEC C13 cable. You know, the AC cable from your computer or your guitar amp, don’t worry we sell them too, check the related items. Note: Only the pin next to 5V is grounded. The pin next to 12V is not connected (NC). Please refer to the picture of the bottom of the unit for more information. Also the AC cable isn’t included in case you have one laying around or you’re outside the US and will need a different mains plug.